Read here about struts, the member of a tensegrity structure that bears compression as opposed to the tendons that bear the tension. The most common strut is the linear strut--see morphology below for other strut types including curved, nucleated, and ring types. Struts are local, tendons are global: this corresponds to local compression and global tension. As struts compress, they widen in the middle, and are subject to leverage and shear. Some tensegrity structures deploy compressive elements composed of more than one strut. The X-Piece by Snelson (1948), for example, deploys an "X" shaped module, a wooden cross that can be described as two intersecting struts. For more discussion of such forms, see Strut, Nucleated. Struts can assume many forms including linear (the subject of this page), curved, nucleated, and ring. Some prominent tensegrity researchers argue that struts in a tensegrity are linear by definition. Such an argument assumes that a proper tensegrity structure segregates compressionand tension along geodesic lines, geodesic meaning the shortest or most efficient paths. A straight strut expresses the geodesic of compression, being a local straight line separating the locii of compressive force. Tendons in tension, in turn, express the tension geodesic of the structure. Any other shaped strut, such as a curved strut, does not outline a geodesic. It will therefore combine tension and compression in one tensegrity element. Levin wrote: "If tension and compression are to be segregated as states in the initial premise,, then you cannot use curves struts. Curved struts are compressed on one side, tensioned on the other.... The tension and compression that are always at play are accounted for in this approach by a fractal tensegrity model, where every material component is, in itself, a smaller tensegrity." Linear struts often outline compelling patterns in space. For example, the linear struts of the 6 strut t-icosa may be deployed in perfectly mutual perpendicularity. 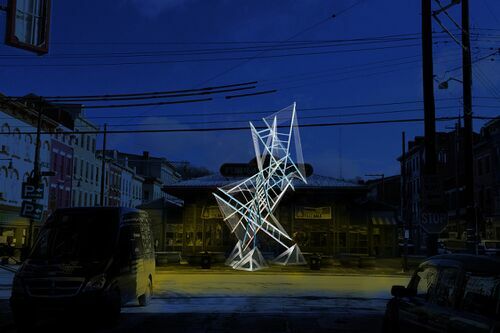 Push-pull sculpture, night time elevation view. By Raffi Tomassian. The compressive forces when applied precisely orthogonally to the strut will cause the strut to bulge at its center. (The strut still coheres structurally due to the tensive Van Der Waals forces allowing its molecules to cohere.) However, no force is ever precisely 90 degrees orthogonal to the strut, and the offset causes the strut to bear more compressive load in one direction. The locus of tension, when it exceeds the material's tensive strength, will shear, meaning that it ruptures. Below is a diagram of loaded struts. From left to right: (a) strut with both ends pivoted; (b) strut with both ends fixed; (c) strut with one free end and one fixed end; (d) strut with one pivoted and guided end and one fixed end. Loaded struts. From Mechanical Engineer's Handbook, Edited by Dan B. Marghitu, Figure 2.11"